Surat the well known city of Gujarat was the hub of trade since the Mughal era and today it is the commercial center for textiles. It is a perfect shopping destination not only for textiles, elegant silk and other fabrics but also for brocade and diamond jewellery, silverware, wood and ivory artifacts, bangles, khadi, handlooms and handicrafts. Seeing these fascinating things, the incredible work of the skilled artisans is worth appreciating. For shopping in Surat, you must give top most priority to the best shopping markets in Surat. Street shopping has more surprises and best deals to offer at reasonable prices. You can benefit more if you are good at bargaining. The wholesale textile markets in Surat offers best handloom at unbelievably low prices. They offer tanchoi, patola, silk sarees with awesome bandhani work and beautiful embroidery and also various fabrics with handmade zari, salma and kinari work. Everything from traditional to latest trend is available. 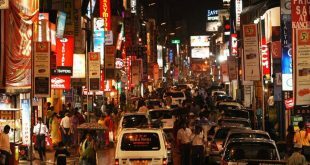 There is a biggest list of markets in Surat out of which here are the top 10 markets that can make your shopping an enjoyable and beneficial one and you will return home with your hands full of shopping bags and heart full of satisfaction and happiness. In Sahara Darwaja there are many textile markets consisting of several manufacturers and wholesalers of textiles and sarees. The textile markets are situated at the south of Sahara Darwaja. It is one of the well known textile markets in Surat. Here there are several shops selling wide range of handloom, silk, embroidered sarees and drapes the traditional dress of Indian women. Many other shops have several varieties of beautiful and colourful salwar kameez, dress material and embroidered fabrics and so on. As the shops in this market sell sarees, fabrics etc.on wholesale, it is also considered to be one of the best textile wholesale markets in Surat. This market is crowded with people who are interested in purchasing textiles in bulk and that too at reasonable rate. This market is often visited by women because of the varieties offered here at an affordable price. Interested in going for shopping at malls, Dumas Road is the ideal choice. There are many attractive shopping malls such as VR mall, Iscon mall, Rahul Raj mall, Central mall, Canopus mall,Imperial square mall and many more at this market place where you get to purchase wide range of ordinary as well as branded items like clothes, footwear, cosmetics etc. at one place. There are restaurants and food courts serving delicious food and also ice cream and coffee shops. These malls are mostly visited by shopaholics and funseekers and also families who want to shop, enjoy and spent time together. 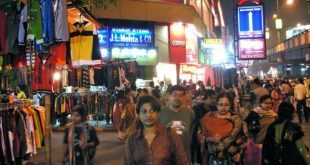 Dumas Road is a very busy market place with people anxiously visiting the different malls in this area for shopping.With number of malls and supermarkets, Dumas Road is regarded as one of the best markets in Surat for shopping. 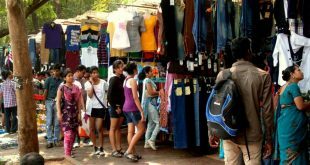 If you are an antique lover and want to buy anything from antiques, home decor, furniture, kitchenware to apparels and several other things at throw away price,Shanivari market near Makai Pul is the perfect shopping place to visit. As the name indicates it is a market where you can go for shopping only on Saturdays. 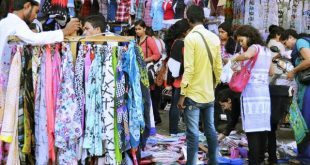 People from all over the area visit this largest street market in Surat for shopping various items like antique lamps, arts, show pieces, utensils, pots, bowls, plates, cosmetics, shampoos, footwear, readymade women’s wear, men’s wear, kid’s wear. Beside you also get pure cotton, linen, georgette,chiffon, silk fabrics with wide variety of designs and prints. Colourful and beautiful, laces, linings, dupattas, leggings matching your outfits are also available. Second hand articles are also sold here, specially furnitures but in good condition. For buying fresh fruits and vegetables you need not go anywhere, the same is available here. Everything is available at one place at a very lower rate. 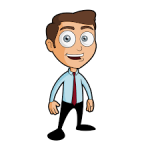 If you are good at bargaining then you are lucky enough to get things at nearly half the rate. 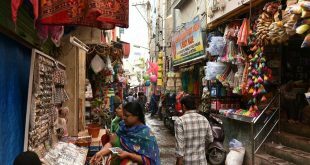 It is very crowded, so better visit this cheap market in Surat early in the morning to get good stuff within your budget. Do not forget to take your own carry bags and beware of pickpockets. Old Bombay Market is a very important textile market in Surat. It is one of the famous wholesale cloth markets in Surat where number of manufacturers, suppliers and wholesalers have their shops that deal with wide range of ordinary and designer sarees, colourful premium quality fabrics, designer men’s and women’s wear. Shops in this market has awesome varieties of printed and embroidered cotton, silk, fancy and designer sarees, salwar kameez, fancy anarkali suits. There are many saree markets in Surat out of which Old Bombay market has a huge collection of all types of sarees that attracts many ladies who come for shopping and end up purchasing many sarees.For purchasing superior quality colourful fabrics, sarees, lehengas and other garments for wedding, engagement or any other special function this market of Surat is an ideal choice. All this can be purchased in bulk quantities at a reasonable rate. Ghod Dod Road is the known to be one of the best markets in Surat consisting of many shopping malls selling ordinary as well as branded stuff. It is the perfect shopping place for women wanting to buy branded outfits from famous boutiques located here such as the Rama’s Haute Couture, Tambour, Tamarind, Aquarians etc. Shopaholics, youngsters and families wanting to enjoy their shopping can visit the famous shopping malls like Sarela Shopping Centre, Jolly Arcade, Rangila Park, Regent Mall, G3, Chocolate Mall at this marvelous! shopping place. Besides there are many jewellery shops and other outlets having varieties to offer. The restaurants over here offer delicious food that can be enjoyed by all. The night market in Surat thani is the best place to have late night food in the city. It is the best food buster with multiple options of delicious food. There are many food stalls serving varieties of veg and non- veg items, ice creams, cold drinks etc. You can enjoy the cool atmosphere and lovely food with your friends or families. Almost every counter there is take away facilities. Youngsters enjoy this place shopping and roaming around and having a good treat of their favourite food at reasonable price. Besides you can also get variety of shoes, bags, cosmetics, clothes and so on. Baroda Prestige a market in Surat well known for ladies artificial jewellery shopping. Here you get all types of glittering, beautiful and attractive artificial jewellery like ring, necklace, bracelet, bangles, earrings at less rate. 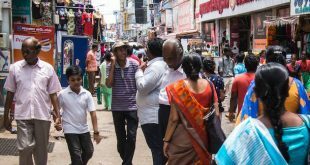 This market is mostly crowded with ladies busy buying artificial jewellery matching their outfits and bargaining with the vendors. Chauta Bazaar is one of the oldest market in Surat, Gujarat. Today’s Mota mandir in Chauta was centuries back known as Vaishnav Haveli which was surrounded by many shops run by Vaishnav traders selling utensils, clothes, grocery, cosmetics and other household stuff. This still continues, but now you will also find many shops selling ready made garments and artificial jewellery in this local market in Surat. Universal textile market is today’s trade center for textiles situated on the Ring road corner. It is the best business place for many manufacturers, wholesalers, retailers and suppliers dealing with superior quality fabrics, ready made garments and numerous varieties of sarees. Out of the number of textile market in Surat this market is also a significant one. This market is very spacious and have a large parking place. Here you can find leading manufacturers and wholesalers of cotton, dyed, fancy, embroidered, georgette, polyester and silk fabrics, ladies bridal wear, chaniya choli, kurtis, salwar kameez, and designer outfits, fancy, silk, printed, embroidered, party wear and designer sarees. There are others dealing with beautiful crochet lace, saree border lace, zari lace, jacquard lace, fancy lace, decorative lace etc. Availability of such wide range of textiles has made this market one of the best cloth markets in Surat. Supermarkets in Surat are best markets to purchase wide range of essential products at a subsidized rate. The benefits of these markets are that we need not go to different places to buy different items. Everything is available at one place. Dhiraj Sons The Mega Store is one such supermarket that offers great products like cereals, pulses, oil, biscuits, cold drink, paper plates, napkins, bags, cosmetics, toiletries, stationery items, frozen food, cheese , butter, gift articles, footwear, fresh fruits and vegetables and many other items required at home. Many a times this supermarket offers great discounts and amazing deals. All the products are kept at different aisles, so it is very convenient to shop in this market. Parking facilities is available. Overall shopping in this market is enjoyable and beneficial as we get good quality products at reasonable price. 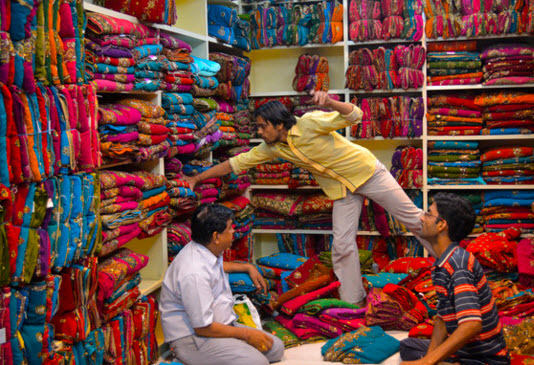 Fabric markets in Surat are located at several places. Apart from this there are a lot of famous diamond markets in Surat. It is a hub of global diamond trade and as the list of textile markets in Surat is very large it is also called the textile city of India.